The frequency of my various appointments is really increasing now. It's a lot to juggle, and it's making me a bit tired, but it's WONDERFUL to know that I have such a good group of health professionals looking out for me and for my baby! I've been starting to feel more tired again. It could have to do with this stage of pregnancy, but I've also been very busy, so that could explain it too. Also, the baby has been putting more and more pressure on my bladder, so my visits to the bathroom are becoming more and more frequent - including during the night, which probably also helps to explain the tiredness. I'd really LIKE to be sleeping well NOW because a good night's sleep will be nothing but a memory once the baby is actually HERE - but it's getting more and more difficult to sleep soundly at night. Oh well...such is the life of a pregnant woman, I suppose. The baby is moving more and more all the time. Lately it's been a lot of pushing by her, instead of so much kicking. Often I can feel exactly where her head is, but I haven't managed to pin-point any other body parts. Just her cute little head that's still on top (I'm urging her to put in down, but she's not listening to her Mom...practice for the future, I suppose). She still has been getting the hiccups from time to time, which is a funny feeling. Last week I had an appointment with my endocrinologist. It went very well. My bloodpressure was high, but it's always high there, even though it isn't nearly as high at my OB appointments. There's actually not much to mention from this appointment. I had a couple of things I wanted to discuss with her (e.g. I'm having some mild lows at night), but also had a couple of suggestions for fixing these things. She agreed with my suggestions and said she had nothing else to recommend. I'll be back to see her again next week (the schedule is every 2 weeks now). This week I had an appointment with my OB again. My bloodpressure was still a little elevated there, but he's still not worried about that. It was pretty soon after I got there (walked), so I'm not surprised it was a bit elevated. Like I said, it was much lower than the reading last week at the endocrinologist. The baby's fetal heart rate was good. Fundal height (i.e. uterus length) is 32cm. Interesting b/c I'm 30 weeks, so it would normally be closer to 30cm. Which begs the question.....were we right about the due date the first time?? Hmmm.....more on that in the Fetal Assessment section below. My ankles are swelling a bit, but he's okay with it. Baby is still breech from what he can tell. He showed me how to feel her head and it's definitely on top! I asked him what the reasons would be for inducing any earlier than 38 weeks, and he said if (a) the baby is big (re: diabetes), but he said that is very unlikely given my good control (all my hard work is paying off! ), or (b) if she's no longer getting adequate nourishment from the placenta. So it sounds like 38 weeks is definitely what we're aiming for. We also had another fetal assessment this week. The baby is over 4lbs now (we can't remember if she said 4lbs or 4.5lbs). She is at the 60th percentile, size-wise. She was 40th last time, but they said the difference is due to the margin-of-error, and that her growth is perfect and that she's still definitely the right size for her age (i.e. new due date is still considered correct). This is a much more precise measurement than the fundal height measurement at the OB's office (i.e. a tape measure on my belly). They said everything looked great and there were no concerns. It is SO good to hear this! I know I've been taking very good care of my diabetes, but there's still the worry at the back of my mind - Is it enough? So far it's definitely been enough because she's doing GREAT! She is still breech, and has her feet up by her ears (she's doing yoga already! ), but still has plenty of time to turn. We only got one picture and it's very hard to distinguish because she was being very difficult and moving around a LOT. I'm attaching it anyway....you folks can see if you can decipher it any better than we can. The resident doctor who was observing could see my belly moving from about 4 feet away. They seemed surprised, but pleased, at how much she was moving - although it made taking some measurements difficult, and made a good face-picture impossible, unfortunately. Maybe next time. Another appointment I had this week was with a counsellor from the Youville Diabetes Centre here in Winnipeg. I've been seeing her from time to time for a while, and realized that I should be making the most of her services during the pregnancy and in preparation for labour! This week she did a "hypnotherapy" exercise with me that I REALLY liked! (To clarify - "hypnotherapy" is not "hypnosis" as you would see on TV or in the casino or something like that. During hypnotherapy you are fully conscious and know what is happening, but you're in a deep state of relaxation that allows you (and the counsellor) to tap into your subconscious as well. It's very interesting and I have had some amazing success with it in the past too! Email me if you want to know more about it!) Anyway, this session brought me to a deep state of relaxation, and then helped me to "imbed" in my mind a number of positive thoughts about the pregnancy, the upcoming labour/delivery, and about being a mother. My counsellor recorded the session, and now I have it on my blackberry so I can listen to it (and do it) anytime I want! It's really great and really relaxing! Anyway. Long post this week, but that's all for now. 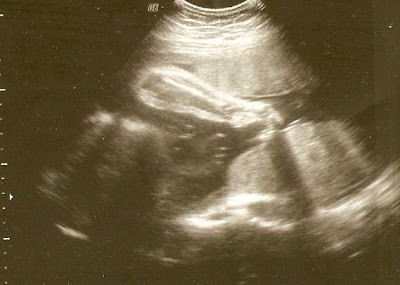 Here's my latest fetal assessment picture - maybe you can decipher it better than I can! Prenatal massage was one of the highlights of my pregnancy--glad to see everything;s going smoothly! What a wonderful article. I commend you for taking such great care of yourself. I am a hypnotherapist and a massage therapist and these are great tools to use during preganancy, so it is great that you are receiving these treatments. I have known women who even went through childbirth using hypnotherapy and did so without any pain. Thank you for making that distinction regarding hypnotherapy. So many people have the idea that a person would be totally unaware and yet it is the opposite as it heightens your sensitivity and awareness and yet, like you said, puts you in such a deep relaxtion that your subconsious can be accessed and easily let go of old patterns and adopt new healthy positive ones. Best wishes for the remaining pregnancy and healthy happy birth! WEEKS 27 & 28 - SOME IMPROVEMENTS!